SIUE double alum Camille Emig-Hill, a communications expert, business and financial services professional, and community and youth supporter, received the University’s Distinguish ed Service Award at its May 2016 commencement. She earned a bachelor’s in mass communications and journalism in 1972 and a Master of Business Administration in ‘77. Emig-Hill spoke at the Friday evening and Saturday morning ceremonies. She addressed the graduates and their guests, saying she felt, “humbled, very grateful and a little overwhelmed” to be receiving such an award. While working on her undergraduate degree, Emig-Hill worked at the Alestle, where she held many positions from reporter to editor. She also met her husband at the campus newspaper. Bob Emig was the sports editor at the time. After graduating from SIUE, Emig-Hill began her career in business communications with Ralston Purina. Later, she went to Anheuser-Busch, where she worked for 30 years and retired as director of human resources shared services. 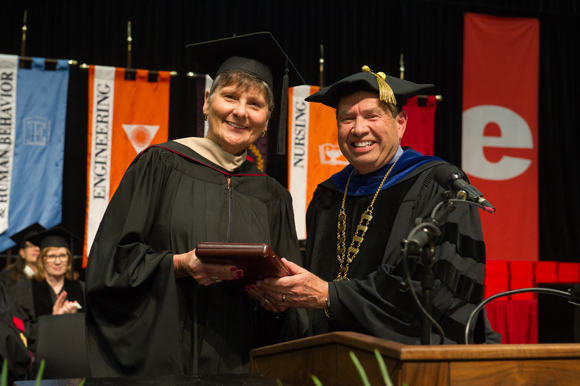 Throughout her career, Emig-Hill has been actively involved with her alma mater. She has returned to campus numerous times to speak to students, and she often fills communications openings at her companies with SIUE graduates. In the late 1990s, Emig-Hill joined the SIUE Department of Mass Communications Alumni Advisory Board. During her tenure, she set up an endowment in the name of her late husband, Robert Emig, who was a 1971 SIUE mass communications alumnus. The annual scholarship is to support worthy mass communications students. In 2006, Emig-Hill joined the School of Business Advisory Board and continues to serve as a member of that group. Emig-Hill also serves the community as chairman of the board of the Bob Emig Foundation. Her oldest son, Aaron, started the foundation in 2004 to continue his father’s work of helping youth develop well-rounded lives by providing a healthy sports experience. The foundation annually supports more than 20 youth sports organizations in various ways. Emig-Hill cited examples such as providing uniforms and equipment for several St. Louis inner-city schools, and assisting with developing a soccer program at the Jackie Joyner-Kersee Center in East St. Louis. In 2013, Emig-Hill was elected to the SIUE Foundation Board, where she is the chair of the major gifts committee.